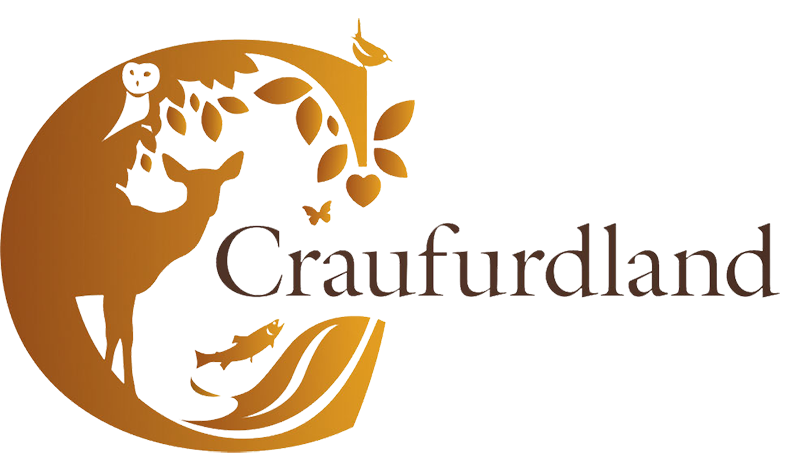 Natural Woodland Burial Ground “Craufurdland Woods” – a woodland in the making, “plant a tree instead of a grave stone”– a natural funeral which is a softer, gentler and more mindful way of saying goodbye to your loved ones. The oldest operating private natural woodland burial ground for natural funerals in Scotland, alternative to traditional funerals. Craufurdland Woods was setup by Dad, Peter Houison Craufurd, after Mum, Caroline, wondered if it was possible to be buried under the Ceder in the front lawn. As both Mum and Dad wanted a natural funeral, after some research, Dad set up the Natural Woodland Burial Ground, where he now rests amongst some of the trees that he planted. “Craufurdland Woods” provides an alternative to a traditional cemetery funeral or ashes interment in a magnificent location set in the beautiful Ayrshire countryside on Craufurdland Estate, near Kilmarnock. Surrounded by mature Ash trees and Hawthorn hedgerow, this natural burial ground is quiet and tranquil, with views only interrupted by a scattering of farms in the distance. Craufurdland Woods uses a membership scheme, which entitles members to a plot within the woodlands measuring 10ft by 6ft. Coffins used within the “Woods” must be ecologically friendly, either cane, pine or cardboard. We have a selection of these available. We are all used to choosing how we celebrate our birthdays, wedding and anniversaries, but our choices for funerals often appear to be more restricted or dictated No two funerals should be alike or need to be alike. Here at Craufurdland Woods, Natural Burial grounds, and the services associated with them give a much greater flexibility, and allow individual celebrations, for individual lives. We work with you to ensure the arrangements are just as you would wish. The Castle can be hired for an intimate funeral service and/or Funeral tea. The graves are marked by an indigenous tree of your choosing, should you wish it, the graves can also be marked with an engraved natural stone plaque. The grass is a natural source of food to the sheep who roam on the pastures in the summer months. Early in the year, we write to the families to ask which tree they would like to plant from the list of indigenous trees. The plot is pre-prepared for the family to plant the trees. Simon or Alex are on hand should the family request help in planting the tree. We chose February to plant the trees as it is the best time to give them the best start in their life. Our families tell us they like that the tree planting is sometime after the funeral as it gives them the opportunity to celebrate their loved ones life. Please be mindful when placing memorabilia on the graveside, that all items are natural and biodegradable and in keeping with the ethos of the Natural Burial ground. Please ensure that all flowers are taken out of plastic wrappers and ribbons removed. Membership rights for Craufurdland woods cost £850 and are valid for 50 years. Interment including grave preparation within the plot is from an additional £450. A woodland tree or shrub from an approved list will be planted on each plot at the appropriate time of year, plus other plants and bulbs. If you wish to choose your own species of tree this may be done by prior arrangement. All aspects of burial handled well. Beautiful location environmentally sound. Helpful family service in a beautiful spot. I am so pleased that my son lies in such a peaceful place. Simon and his family have been so helpful in this sad procedure. Could not have a nicer place to be laid to rest. Staff have been extremely helpful, over the whole period. I’m looking forward to being placed beside her. We were treated with great respect and friendless, without having to stand on ceremony nice simple burial in a beautiful, place which Danny wanted. A very tranquil and uplifting burial ground. Makes visiting a memorable experience. This is a family run estate. All of the personnel are professional and courteous in their manner. They are also mindful of the needs and wishes of the bereaved. Excellent service, wonderful setting and a lovely natural memorial for loved ones. Our Plots are all the same size (10 foot by 6 foot) to allow a reasonable spacing of the trees which are planted on each plot as a memorial. Plots may be used for memorial, ashes interment or for traditional burial. All plots cost £850. Download Burial Trees The following is a list of trees which may be chosen for planting to mark a grave. Field Maple (Acer Campestre) * Sycamore (Acer Pseudoplatinus) Common Alder (Alnus Glutinosa) Silver Birch (Betula Pendula) Downey Birch (Betula Pubescens) Hornbeam (Carpus Betulus) Ash (Fraximus Excelsior) Crab Apple (Malus Sylvestris) * Black Thorn (Prunus Spinosa) Gean (Wild Cherry) (Prunus Avium) * White Willow (Salix Alba) Rowan (Sorbus Aucuparia) Swedish Whitebeam (Sorbus Intermedia) Cherry Plum (Prunus Cevasifera) * Holly (Ilex Aquifolium) At extra cost:- Beech, Oak, Chestnut * Please be aware that some species are more ‘fragile’ and may not take well at the site. The woodland will be maintained and cared for with primary regard to its longevity and natural appearance, allowing the trees, wild flowers and bulbs to flourish. The estate will be using a buried microchip with a unique signature and an indefinite transmission life to identify each plot. Plots may be visually marked, if so desired, using small wooden or natural stone plaques placed near the ground so as not to interfere with maintenance. Plaques may be purchased from ourselves. Craufurdland Woods are governed by a set of rules by which all members, their friends and family must abide, details of which are available on application, or on the website. Craufurdland Woods represent an increasingly popular choice for a final resting place, offering various benefits for Scotland and the environment. Burial within the woodland site is an opportunity to enhance the natural cycle of the earth, accentuated through our policy of only using biodegradable caskets and the planting of varied woodland trees, plants and wild flowers. The burial ground can be a non-denominational or non-religious alternative to that of traditional burial sites. However, plots can be consecrated for those members who so desire. The costs associated with woodland burial are usually considerably less than traditional funerals. Please see our website for further details. Meeting our clients needs is the primary aim of Craufurdland Woods, and it is with this in mind that we are now offering to arrange burial from outside of Scotland. This option has been considered for either UK residents who die abroad, or for citizens of other countries who would like to be buried in Scotland, possibly coming back to the land of their ancestors. The practicalities of bringing a loved one from overseas require specialist experience and understanding of this complex and delicate issue. To this end, we only work with Kenyon Christopher Henley, International Funeral Directors, who are specialists in Repatriation. They will arrange the collection of the departed, prepare them for their journey and all aspects of the flight(s) to Scotland. 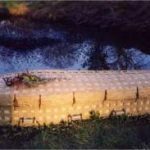 The costs of these services obviously vary due to location, but as an example, cost from New York to Scotland would be approximately £2500 ($4300) On arrival in Scotland, the coffin will be taken to a local undertaker (a long serving and trusted local family firm), where the deceased will then be placed into a suitable biodegradable coffin. The funeral service will then be arranged to your requirements, and conducted at the burial ground. The plot will have the chosen tree planted on it in the following spring, and the grave may be marked with an oak plaque. Family and friends are always welcome at the burial ground, be it at the time of the funeral, or after the burial and we will always be happy to help with travel arrangements if so required. The costs of the funeral depend widely on the requirement. These will usually start at approximately £2000 ($3500), including the plot, interment, transport with hearse, official mourners and a short grave-side service. In addition, the service may be filmed and presented on DVD. All costs will be confirmed at the time of arrangements. Please contact us directly if you would like to use this service. Download Our Burial Rules The rules and regulations for Craufurdland Woods are formally detailed below, however they are in place to ensure that the ‘Woods’ are treated with respect and care by all, and are not intended to be restrictive. Recitals 1.1 Craufurdland Limited, having its registered office at Craufurdland Castle, Kilmarnock, Ayrshire, KA3 6BS (the "Company") is the heritable proprietor of the Burial Ground at Craufurdland Woods, Midland Farm, Fenwick, Ayrshire, KA3 6BY as shown on the attached location plan (the "Burial Ground"). 1.2 The Company has issued and will issue Certificates granting to individuals an exclusive right of burial within the Burial Ground. 1.3 It is right and proper that the Company make and enact these Rules and Regulations for the general management and control of the Burial Ground (the "Rules"). 1.4 Each Certificate issued by the Company (the "Certificate") is issued subject to the Rules. Exclusive right of burial 2.1 A purchaser of an exclusive right of burial within the Burial Ground shall, on payment of the sum of £850, be furnished with a Certificate which shall confer the exclusive right of burial for a period of 50 years from the date of interment. Production of the Certificate will be taken as authority to exercise such right. 2.2 One person only shall be registered as the holder of a Certificate (the "Holder"). 2.3 The Holder will not be able to sell the Certificate or transfer it or assign it except back to the Company. 2.4 Where a Certificate is lost or defaced by the Holder, the Company will issue a duplicate in exchange for a fee of £50. Forfeiture 3.1 Failing the interment of the Holder within the period of 50 years from the date of signature by the Holder of the Certificate, the right under the Certificate shall lapse automatically and no notice thereof will require to be given by the Company nor shall any liability attach to the Company. Interment 4.1 On the occasion of the death of the Holder, his executor(s), personal representative(s) or next of kin (the "Responsible Person") should advise the Company of the intended burial and shall pay to the Company the appropriate sum as shown below in respect of the interment: £450 cost of interment weekdays £650 cost of interment Saturdays £750 cost of interment Sundays and Bank Holidays £150 cost of interment of cremated remains weekdays £250 cost of interment of cremated remains weekends and Bank Holidays 4.2 Notice of proposed interment must be given to the Company by the Responsible Person as early as possible and, in any event, not less than two working days notice (excluding Saturdays, Sundays and Public Holidays) must be given. Such notice should state the name and address, age and date of death of the Holder and the name, address and contact details of the Responsible Person. The day and hour of the proposed interment should be agreed with the Company and such other information reasonably requested by the Company shall be given timeously. 4.3 The body of the Holder may not be embalmed. 4.4 Upon the arrangements in 4.1 and 4.2 having been implemented, the Company will arrange for the opening of an appropriate plot. Cremated Remains 5.1 If so wished by the Holder or by the Responsible Person, the cremated remains of the Holder rather than his or her body may be interred in the plot. Notice of proposed interment must be given in the same manner and subject to the same provisions as in Rule 4. 5.2 Cremated Remains may not be scattered on any part of the Burial Ground. Records 6.1 The Company shall keep adequate records in which shall be entered every interment, specifying the plot number, the micro chip number, the date of interment, and the name and age of the Holder. 6.2 A plan of the Burial Ground shall be kept at the office at Midland Farm. Funeral Arrangements 7.1 Coffins and, in the case of cremated remains, boxes, must be made of pine, wicker or cardboard and metal handles and/or plaques on the coffins are expressly prohibited as is the use or inclusion of anything other than biodegradable materials. Any enquiry in respect of this matter should be directed to the Company. 7.2 In the event that the Responsible Person instructs professional Undertakers in connection with the Funeral Arrangements of the Holder, the Responsible Person shall pass to the Undertakers a copy of the Rules and, so far as relevant to such arrangements, the Undertakers shall be bound thereby. 7.3 In the event that professional Undertakers are not so instructed, the Company may, if requested by the Responsible Person, assist in the making and implementation of such arrangements as may be necessary or appropriate but, in the event of the Company so doing, additional charges will be incurred and the Responsible Person shall be advised accordingly prior to the day of intended interment. 7.4 In order to minimise damage and disturbance to the Burial Ground, only close family and friends may attend the interment. Memorials 8.1 No tomb, monument, memorial stone or otherwise may be erected on the plot or within the Burial Ground. If wished, the Responsible Person may lay a wooden or natural stone plaque on which there is engraved the name and date of death of the Holder but such plaque shall not exceed 6 inches by 6 inches by 1 inch and shall be laid within the plot flush with the ground level so as not to impede or restrict the grass-cutting or other maintenance activities of the Company. 8.2 Wooden crosses, kerbs, copes, railings, fences, gravel, corner-stones etc or any other such ornamental addition to the plot is strictly prohibited as is the placing on the plot of artificial wreaths or flowers. 8.3 The Company shall locate a microchip beneath the surface of the plot so that its location may be identified. The microchip operates by radio frequency and has an indefinite life. 8.4 The Company, at its own expense, shall plant, at a suitable time in the season, woodland bulbs between the plots and a tree or shrub within each plot and, where the tree or shrub is not selected (from a list held by the Company) either by the Holder or by the Responsible Person, the choice shall be made by the Company. 8.5 In the event of the Responsible Person or the family of the Holder so wishing, additional planting on the plot may be permitted by the Company in advance and in writing. Maintenance 9.1 The maintenance of the Burial Ground shall be entirely a matter for the Company, it being declared that the intention of the Company is that the Burial Ground shall, over the years, become a natural woodland area. General 10.1 The Burial Ground shall remain open at all times unless closed by the Company in cases of emergency or to permit of essential maintenance works. 10.2 No person shall enter or leave the Burial Ground except by the entrances and exits provided for that purpose. Gates should be closed immediately after entry and exit. 10.3 Children under 16 years of age visiting the Burial Ground must be accompanied by an adult. 10.4 No dog shall be admitted to the Burial Ground with the exception of a Guide Dog being used as such. 10.5 At the time of the Company making the Rules, no Value Added or similar tax, duty or levy ("tax") need be applied to any payment whether under a Certificate or under the Rules ("a payment"). If, as a consequence of subsequent legislation, any tax shall be applicable to a payment, a payment shall be deemed to be exclusive of tax and the tax shall be paid to the Company by the Holder or by the Responsible Person, as the case may be. 10.6 The car parking facilities at the Burial Ground are limited and must be used responsibly in the interests of all. Instructions from the Company regarding the use of the car park must be complied with. All vehicles must be driven carefully within the Burial Ground, only within the designated areas, and at a speed not exceeding 5 miles per hour. The Company shall not be responsible or liable for any damage to vehicles, howsoever arising and vehicles entering the Burial Ground are driven at the risk of the owner/driver. Nuisance 11.1 No person shall: 11.1.1 use any profane or offensive language or behave in an offensive, disorderly or insulting manner within the Burial Ground; 11.1.2 wilfully or carelessly obstruct, disturb or interrupt an officer or servant of the Company in the exercise of his duties; 11.1.3 wilfully or improperly interfere with any other person visiting the Burial Ground; 11.1.4 disobey any instruction given by an officer or servant of the Company to ensure the safety and comfort of persons using the Burial Ground; 11.1.5 bring into the Burial Ground any object which may be considered by the Company to be dangerous or offensive; or 11.1.6 climb upon any tree or walk through or over any plant or shrub. 11.2 Cycling, skateboarding, roller-blading or any such similar activity is expressly prohibited within the Burial Ground. Contravention 12.1 Should an officer or servant of the Company have reasonable grounds for believing that a person has contravened, is contravening or is about to contravene any of the Rules, he may expel that person from the Burial Ground. Variation of the Rules 13.1 The Company shall be at liberty to alter the Rules from time to time as it shall think fit and to make and enforce such other rules as it may consider necessary or desirable for the proper or better management of the Burial Ground but shall not be entitled to reduce its obligations under the Rules or reduce or restrict the rights of the Holder or, where appropriate, of the Responsible Person. The Castle can be hired exclusively for an intimate funeral service and/or Funeral tea for up to 40 people. The hire of the grand hall & library starts from £400 in a private backdrop exclusively for you. We work with you to ensure the arrangements are just as you would wish. How does Craufurdland Woods differ from other woodland/natural burial Grounds? Unlike other woodland burial grounds that are in established woods or in parts of traditional cemeteries, Craufurdland Woods is a wood in the making and you choose which “native” tree is planted for this wood of the future. It was started in 2002 by Peter Craufurd, Simon and Alex’s father. How do we arrange a funeral at Craufurdland Woods? We always work very closely with your chosen Funeral Director or your family whichever you choose. In most instances we will show the family around Craufurdland Woods. We will ensure that every detail of the funeral is double checked. If we notice during the arrangement period that a tiny detail has been overlooked, we will draw it to the attention of your Funeral Director immediately. 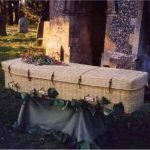 What type of Coffins can I have? 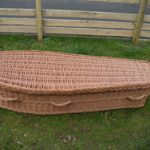 Cardboard, Pine, Bamboo, Wicker, or any other biodegradable coffin, some examples shown on the website. Can I be buried wrapped in a shroud? Unfortunately not, as it may be distressing to your loved ones attending the service due logistics of placing the body in the plot. Yes, a service can be held before coming to Craufurdland Woods for interment. Alternatively, a service can be held by the plot, it can also be blessed. Do we need an appointment to visit Craufurdland Woods? Craufurdland Woods are open during daylight hours. It is advisable to make an appointment to visit if it for looking around to decide if this is for you and we can discuss with you what your exact requirements. Please note, it’s worth a quick phone call if a funeral taking place is that of a public figure and the family have asked for complete privacy. If the plot is not marked how will people find it? Marking the plot is personal. All plots are electronically tagged and recorded on a plan which is held at the office and we will help your loved ones locate the plot. Can we put anything else on the plot or tree? As it is an eco woodland burial ground only biodegradable items are allowed to be placed on the plot or tree. The items also need to be in keeping with the surroundings. We encourage the planting of snow drops, daffodils Scottish blues and other native flowers. Can I book a pre book a plot? Yes, this is a very popular option as more people are making arrangements before they pass away so their families don’t have difficult decisions to make at a time of sadness. This also ensure that your wishes are known to your loved ones. Not at present. Please encourage family and friends to use facilities prior to attending the funeral. From March 18 Laird’s Table’s facilities will be available, (5 minutes drive from Craufurdland woods). Are dogs allowed at Craufurdland woods? Yes, however they must be under control or on a lead and please pick up after your dog as a respect to others. Are the plots double depth? They are all single depth, as your chosen “native” tree is planted on the plot, we do not want to disturb the tree at a later date as it may damage it. Adjacent plots can be reserved for loved ones. Do we need to use a funeral director? Normally a funeral Director is involved to help coordinate different aspects of the funeral, however it is not essential. Do I have to buy coffins from you? We can order them for you or you can get them from your funeral director. Is Craufurdland woods non denominational? We welcome all non-denominational and all denominations. How many people can attend the service? It varies anything from 2 people to over 100. How do we mark the plot? The plot can be marked with a memorial stone or slate if desired. We will supply the stone/slate and the engraving of it. Craufurdland woods memorial stone forms are available on request. Can we put flowers on the plot? Yes of course. Cut flowers may be laid on the plot but in keeping with the woodland environment cellophane and ribbons need to be removed. When flowers start to deteriorate, one of our woodland team will remove them to keep the plot looking well cared for. My father was cremated a few years ago but my mother wishes to be buried when she passes, can we put my father’s ashes in her coffin? Yes, his ashes can be put in your mother’s coffin. It will need to be in a biodegradable container available from your Funeral Director or here at Craufurdland Woods. The full cost dependents on whether it is an ashes interment or burial, however all plots are the same price to ensure that it can accommodate your chosen tree. The difference of cost is the coffin chosen and funeral services. You can choose to pay at the time of booking or after the funeral. You can by cheque or bank transfer. For those who wish to secure a place with us in the future you can pay in advance. Please enquire at info@Craufurdland.co.uk for full details. Can we have the funeral service or tea at Craufurdland? Personal intimate and exclusive funeral service and tea for up to 40 people can be held at The Castle. Foe more information please contact us at info@Craufurdland.co.uk for more details. How will I know that building will not take place on the ground in the future? Burial grounds are protected by the crown and the location of Craufurdland Woods was very carefully chosen, which restricts development on the site by future generations.